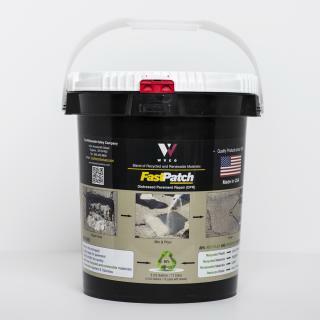 April Special Offer: Purchase 10 or more FASTPATCH DPR Rapid Concrete Repair 5-Gal Kit and receive 1 Eggbeater Style Mixer FREE! - Limited time offer ends Tuesday April 30, 2019 11:59pm. FASTPATCH DPR Rapid Concrete Repair is an easy-to-apply, long-lasting, high-load bearing, polymeric concrete repair material for distressed pavement. FastPatch DPR Rapid Concrete Repair is supplied in complete, ready-to-use kits with a polymer blend of recycled and renewable materials. Each kit comes with two color options of Gray or Black, and both Gray and Black topping sand to blend repair areas with the surrounding pavement. FastPatch DPR Concrete Repair can be applied in cool or warm conditions, and in cold conditions with the aid of FASTPATCH Kicker accelerator (free upon request), to form a permanent repair that is quickly ready for traffic. Sidewalks - repair concrete trip hazards, walkways, "repair instead of replace"
Pothole repair - Permanently repair concrete potholes in just minutes. Prep (clean and dry), mix the pre-measured kit, pour, finish with included topping sand, done. FASTPATCH DPR Rapid Concrete Repair is a high performance rapid cure polymeric concrete that provides long lasting, durable repairs that allow for rapid return to service, within an hour of installation. FASTPATCH DPR Concrete Repair contains a blend of recycled and renewable materials. Click to view bulk pricing. Great product! Made about 30 pothole repairs to 6000 sq./ft. parking lot in June of 2014 and have not had a single problem or reoccurrence since. Recommending to all our properties. Daniel at the support number was very helpful and knowledgeable. Larry Fowlert Lead Tech EPM Property Mgmt. Previously had tried to repair a broken out corner several times with various home depot materials... never lasted. I tried the fastpatch material and am very pleased with the result. Install was straight forward and it looks very nice. It was nice to be able to color blend the surface with my existing pavement. 2 months in and so far so good. Thank you for a good product. Great product! Made about 30 pothole repairs to 6000 sq./ft. ..